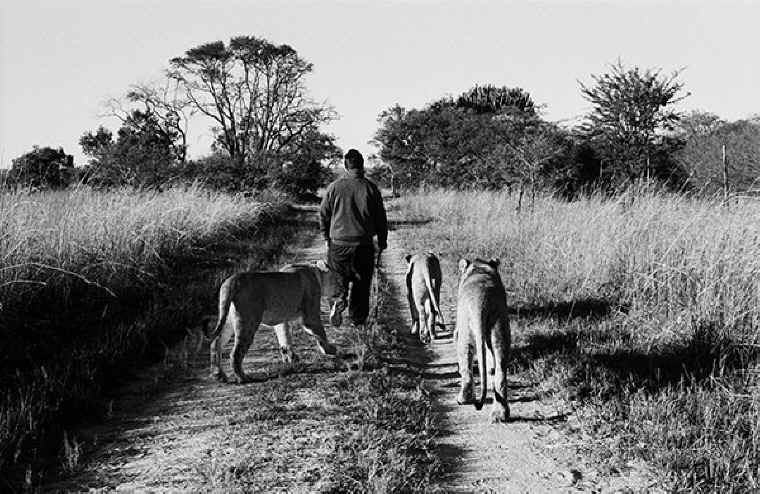 The lions of Zimbabwe are depicted in one of the photographs in our exhibit, ambling along a pathway along with Rabbi Nathan Asmoucha. Rabbi Nathan Asmoucha walks with three lion cubs in Antelope Park, Zimbabwe. The park is undertaking a lion population rehabilitation project. Photo by Toby Asmoucha, 2006. These particular lions have been raised in a protected area near Bulawayo, and are nearing the age when they will be released into the wild. It is a pleasant image, and it evokes a sense of harmony and well-being. Sadly, however, habitat destruction and hunting have contributed to a virtual collapse of Africa’s remaining lion population. In the past twenty years, the number of lions living in Africa has gone from about 40,000 down to 20,000, and though some states have banned lion hunting, others continue to allow the practice. In Zimbabwe, the legal hunting and illegal poaching of lions and other big game animals has led to a disastrous decline of that country’s wildlife. The same characteristics that have inspired our admiration – the lion’s colour, noble bearing, and the impressive mane of the mature male – are the same qualities so desired in a trophy kill by big game hunters. Notably, Judaic religious law (Halakha) dictates that hunting, especially for sport, is not permitted for practicing Jews.